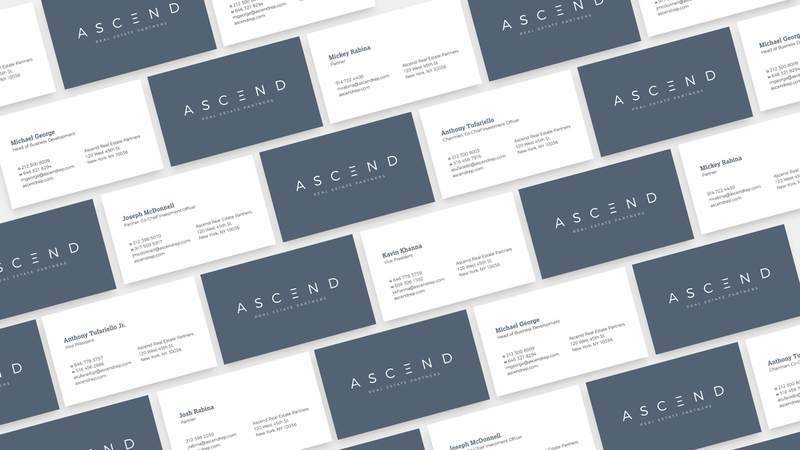 Ascend is a commercial real estate lender and investment manager in New York City. Level was commissioned to develop the firm’s brand strategy, including naming, visual identity, website, marketing books, and collateral materials. Ascend is committed to developing successful, long-term borrower and investor relationships based on the core values of its partners: integrity, fair dealing, transparency, and fiduciary responsibility. The logotype employs custom letterforms in order to suggest aspiration, stability, and expertise. The result is an approachable mark that sets Ascend Real Estate Partners apart from the competition. A subtle color palette with the logotype being used both on white and reversed allows it to be both elegant or strong depending on context. The Ascend website is a company introduction and marketing tool, showcasing their approach to investment and expert leadership. The site also serves as an investor portal for their current clients. In addition to business cards, we also developed email signatures, flyers, and assorted confidential marketing books.